The FIB SUV in GTA V.. The FIB SUV is a Declasse Granger modified for use by the Federal Investigation Bureau in Grand Theft Auto V. Despite the implication of being utilized by the FIB, it is commonly used by the NOOSE when pursuing the player at wanted levels at four stars and higher inside the city limits of Los Santos. Each SUV comes with three NOOSE agents, two of which are armed and hang on the sides of the SUV, shooting at the player and their getaway vehicle. These officers are vulnerable to return fire and can be knocked off the SUV by ramming or flipping it. 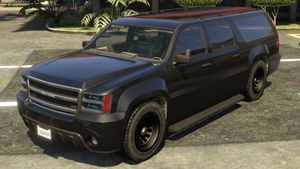 In-game, the FIB SUV is referred to simply as the "FIB", a name it shares with the FIB Buffalo. A pair will sometimes spawn near one of the satellite dishes in Blaine County between 10:00 and 11:00. Spawning seems to be random, though, as it may spawn alongside one FIB Buffalo, or two FIB Buffalos may spawn instead. Granger: civilian counterpart and base platform. Sheriff SUV: law enforcement counterpart used by the Los Santos County and Blaine County Sheriff's Departments. Park Ranger: emergency counterpart used by the San Andreas park rangers. Lifeguard: emergency counterpart used by the Los Santos Lifeguard. FBI Rancher: a similar law enforcement vehicle in the GTA III era. This page was last modified on 4 May 2014, at 22:47.